We're back on our regular scheduled programming this week and back in the Caribbean, because let's face it- where else would you want to be? 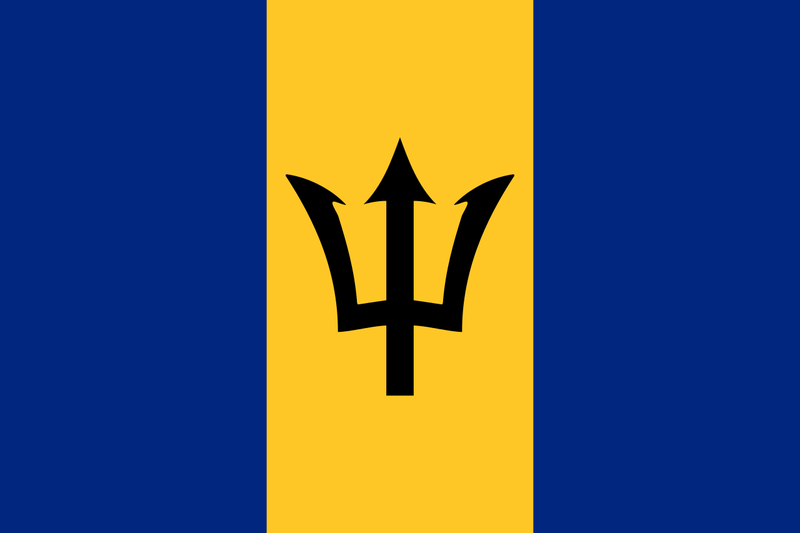 And this week, we've got the flag of Barbados! Adopted on November 30th, 1966- the island's first independence day, it's described as a 'vertical triband' which confused me for a second, but now makes a certain amount of sense- after all- it's not a tricolor, but it does have three distinct bands, which would, after all, make it a triband and not something else. The two blue bands- ultramarine according to the Wikipedia description, stand for the ocean surrounding the country and the the sky- the gold band in the middle represents the sand. The black trident head gives the flag its name- 'The Broken Trident' and the missing staff of the trident is significant because it turns out the old colonial badge of Barbados had Brittania holding the trident- so breaking the trident represents a break from its status as a colony and the three prongs represent the principle of democracy: government of the people, for the people, by the people. Other than being the birthplace of Rihanna, Barbados seems to follow the historical pattern we've seen in most of the Caribbean Islands we've looked at: trading hands between European powers for a bit before settling into British hands. Slavery was a big driver of the economy in the early days until emancipation in 1833. It's had some hurricanes, but doesn't have an active volcano- and in fact, misses a lot of hurricanes due to it's position outside of the main hurricane strike zone. But, it does have an interesting problem: population density and the fact that it's a coral-limestone island. The former means that the government has had to work to integrate growing areas of the country into the sewer system to avoid contamination of aquifers and coral reefs offshore, but the composition of the island means that Barbados is highly permeable and can lose surface water easily. It's highly permeable. Now that's a fascinating- and probably difficult problem for a country to wrap its head around. Anyway, this is Barbados. Until next time, keep your flags flying- FREAK or otherwise!